Strictly speaking, though, I shouldn’t have named this a ‘hotel review’, since The Glasshouse on the Ganges, like the rest of the properties which are part of the Neemrana Group, prides itself on being a ‘non-hotel’. This one, set amidst litchi orchards on the bank of the Ganga just 23 km beyond Rishikesh (very close to Shivpuri and other places known for the adventure sport of white water rafting), is one we’d visited years ago, when it was still relatively small, quiet, and definitely non-hotel-like. Birdsong and the sound of the river dominated. Lazy hours were spent on the resort’s own private river beach, trailing our feet in the water. 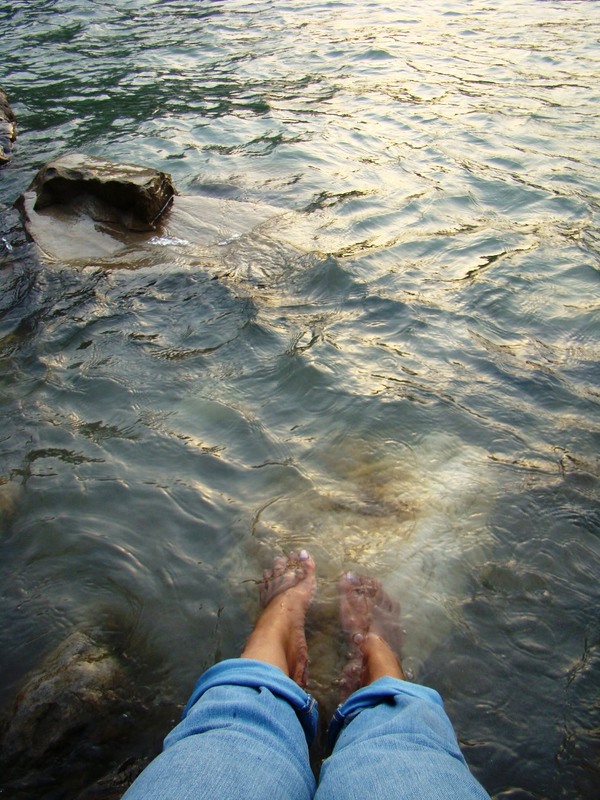 With my feet in the Ganga. This time, visiting with friends, we found that The Glasshouse on the Ganges had changed somewhat. It had expanded, with more rooms, a larger dining area, more people, more expensive cars in the little tree-shaded car park outside. 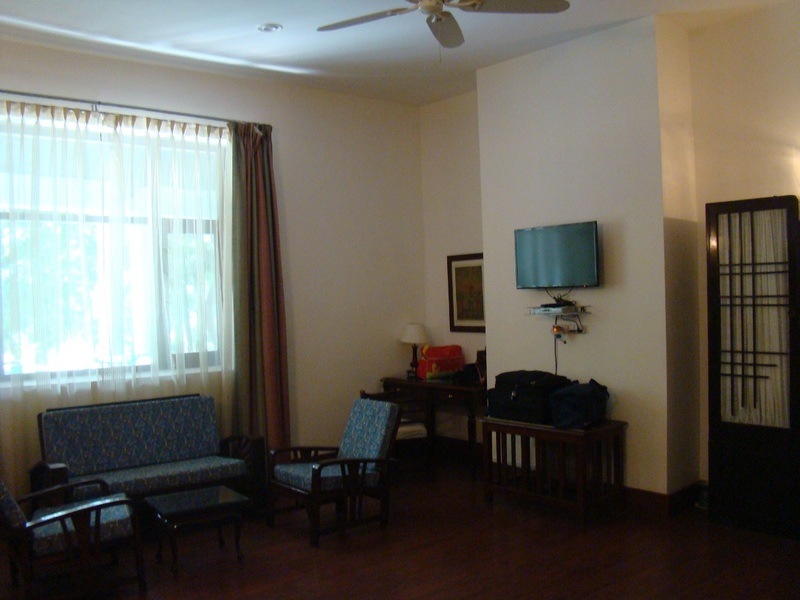 Our room, Jamuna, was a large one, its floor wooden, its AC very effective, and its bathroom straight out of a good five star hotel. In the room was even a flat screen wall-mounted TV (which shook my faith in Neemrana a bit, since the absence of in-room TVs is a Neemrana standard). The furnishings and upholstery were stylishly ethnic, the picture on the walls delightful old posters depicting episodes from Hindu mythology. A view of our room at the Glasshouse. The other half of our room. 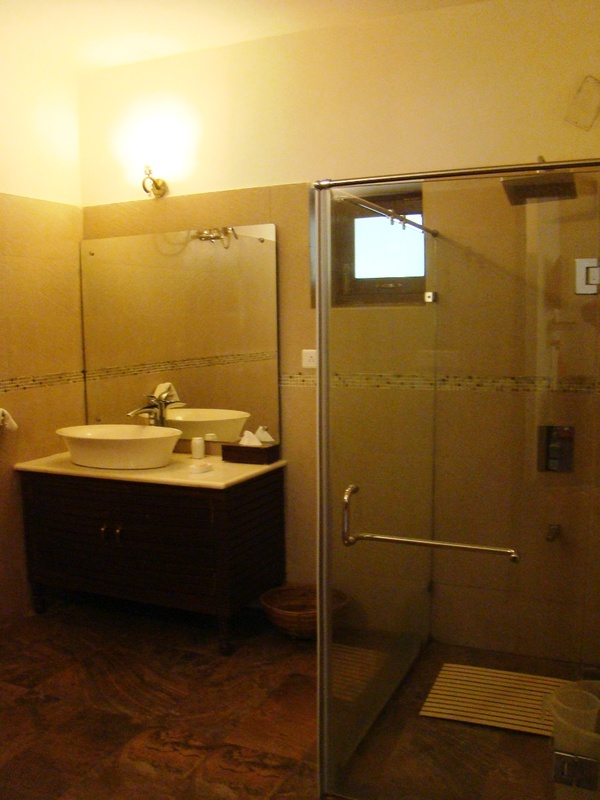 The ceiling fan was a quaint old five-blade one looking straight out of the Raj. The furniture— our double bed and its two bedside tables, the luggage racks, the writing desk and chair, the sofas and coffee table, the cheval mirror, the minibar (adequately stocked with juices, aerated drinks, mineral water, etc, and with complimentary tea and coffee fixings included), and a very interestingly designed glass-fronted wardrobe—all had a warm, comfy antique feel to it. Even though various additions have been made to the list of services and amenities offered (spa services can now be availed of, and barbecues are possible on the beach), there’s still an air of quiet charm to the environs of The Glasshouse. The main hall (which abuts the dining room, with its many large windows overlooking the river and the orchards) has a library cupboard (very eclectic fare, ranging from the Bible and the Geeta to crime fiction and an entire shelf of Mills & Boon). There’s a chessboard, a carrom board, and a table tennis table outside. The main drawing room at The Glasshouse. 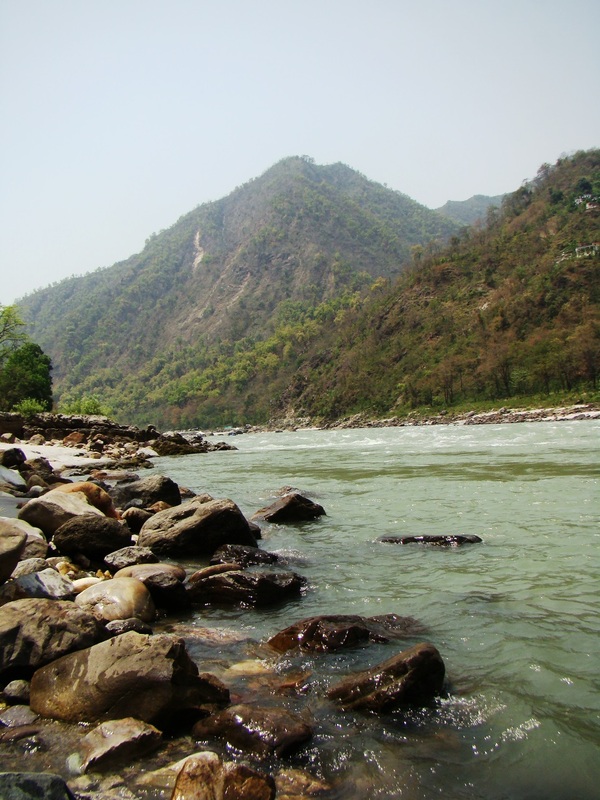 Although one could drive down to Rishikesh and visit the temples there, or go white water rafting, rappelling, trekking, rock climbing, and so so, all we were interested in was unwinding. Our two days at The Glasshouse on the Ganges, therefore, consisted of doing nothing terribly productive. 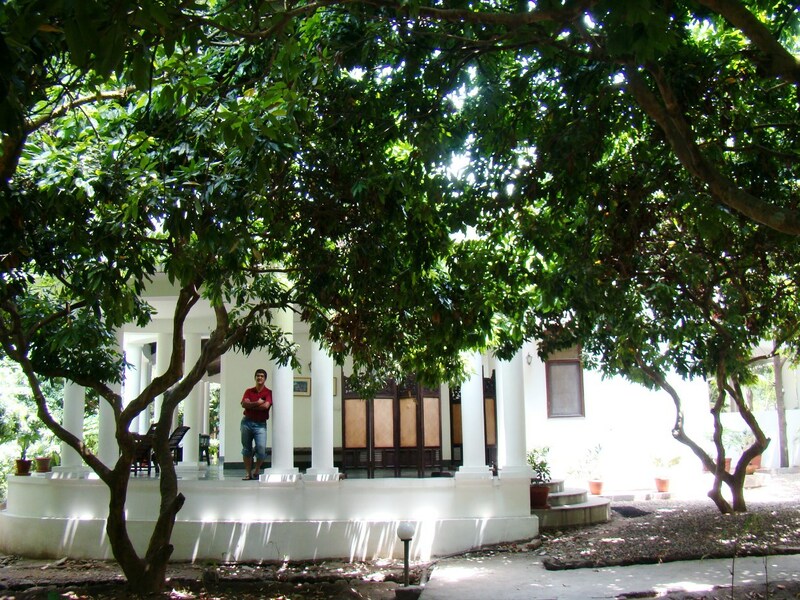 Between meals, we’d either sit out in the little verandah (shaded by litchi trees, a pear tree, and a chilbhil tree, the latter bearing papery-winged seeds that are great fun to peel and nibble on) having tea, reading, and watching bulbuls, tree pies, and little songbirds on the trees, or we’d go down to the silvery-grey beach and sit on one of the rocks, trailing our feet in the cool water. Bliss. The verandah, and our room beyond, at The Glasshouse. 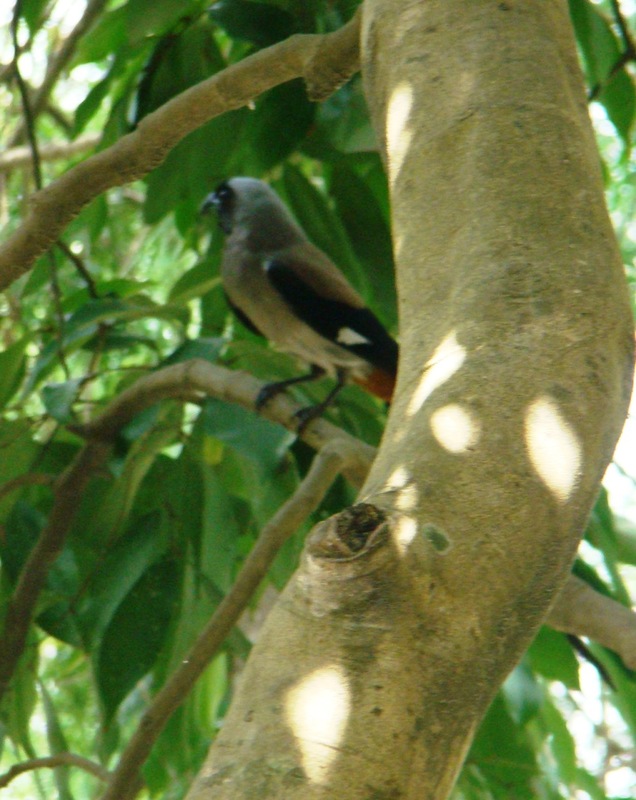 Local denizens: a bird in a tree at The Glasshouse. Although The Glasshouse does offer room service, we preferred to have most meals at the dining room itself. This is a buffet service, with a not sprawling but adequate enough range of dishes. Dinner on the first day, for instance, began with a sweet corn soup (which I gave a miss), a couple of salads, a selection of naans and tandoori rotis, mixed daal, yoghurt, stuffed tomatoes, potato gratin, baingan bharta, mattar pulao, mustard chicken (mustardy yes, but also strangely sweet), and a mutton curry, with—for afters—an unusual chikoo pie, vanilla ice cream, and malpuas with rabri. After a couple of meals, we came to the conclusion that the chefs at The Glasshouse do Indian food better than they do Continental fare. The latter wasn’t outright bad; it was just too run of the mill and unexciting. Meal timings, incidentally, are 8-10 AM for breakfast, 12.30-2.30 for lunch, and 8-9.30 for dinner. We cheerfully focussed on the Indian food (which is mostly North Indian, and good). We took advantage of the fact that our tariff included breakfast, morning tea, and evening tea: just before retiring for the night, we phoned and asked for masala chai to be brought to our room the next morning before breakfast. 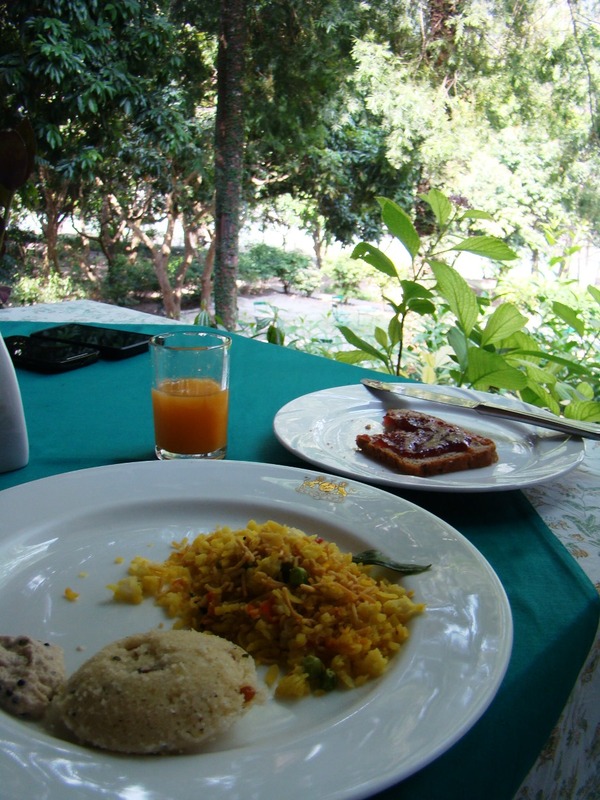 At breakfast, we sat out of the verandah fringing the dining room and watched the river flowing by, the birds and butterflies flitting amongst the pink hydrangeas and the yellow trumpet flowers. Ate poha, idlis with coconut chutney, masala omelette, and soft cheese spread on thin toast. Had coffee, along with toast slathered with plum and peach jam made by Neemrana from fruit grown in Neemrana’s own orchards. Breakfast: idli with chutney; poha; juice; toast with (literally) homemade jam. At about five in the evening, we went to the main hall and browsed through the books while waiting for our coffee to be brewed. Then, coffee cups in hand and a quarter plate loaded with assorted cookies and the most light, delicious namak paras I’ve ever had, we went back out onto the verandah to sit and chat. And so on. 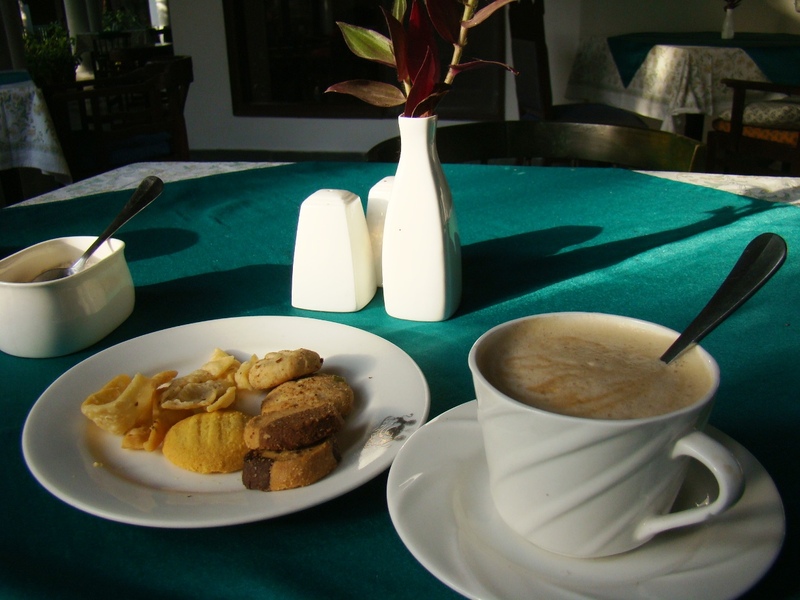 Teatime at The Glasshouse: coffee and a plate of assorted cookies and namak paras. The Glasshouse on the Ganges isn’t the place to go if you want every minute of your holiday crammed with activity, with one sight after another or a sizzling night life. If you want to relax, however, to watch the river flowing by or the birds in the trees (or make friends with the resident marmalade cat, whom we saw slinking about) – well, then, this is it. It’s quiet, scenic, very comfortable, and extremely soothing. 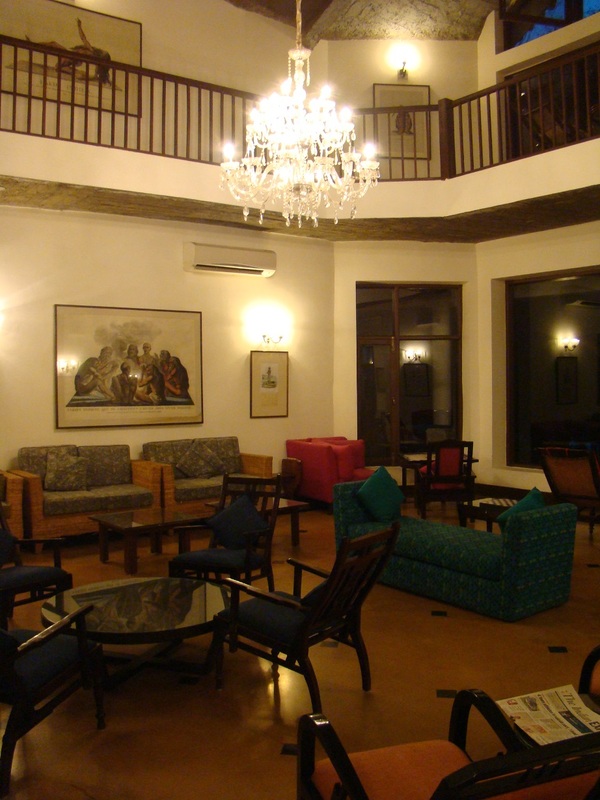 The staff (as is the policy across the Neemrana Group, drawn from the neighbourhood), are helpful and efficient but never intrusive. The rooms and public areas are clean. There are thoughtful little details that make a difference: a fresh water tap and shower head just above the beach; a baby chair in the dining room; even—if you’re inclined to view the Ganga as not just a river, but the holy river—a little riverside temple. And yes, keeping in mind the fact that the world is very connected these days, there is free wifi all across the resort. All in all, a place I’d happily come back to all over again. 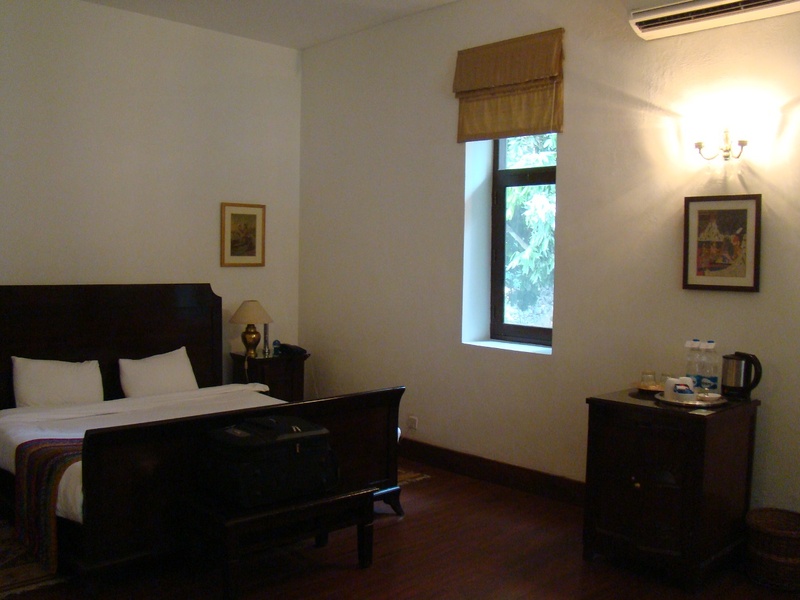 While it is isn’t exactly cheap (our room cost Rs 11,000 a night, with lunch and dinner charges separate), we thought it good value for money. 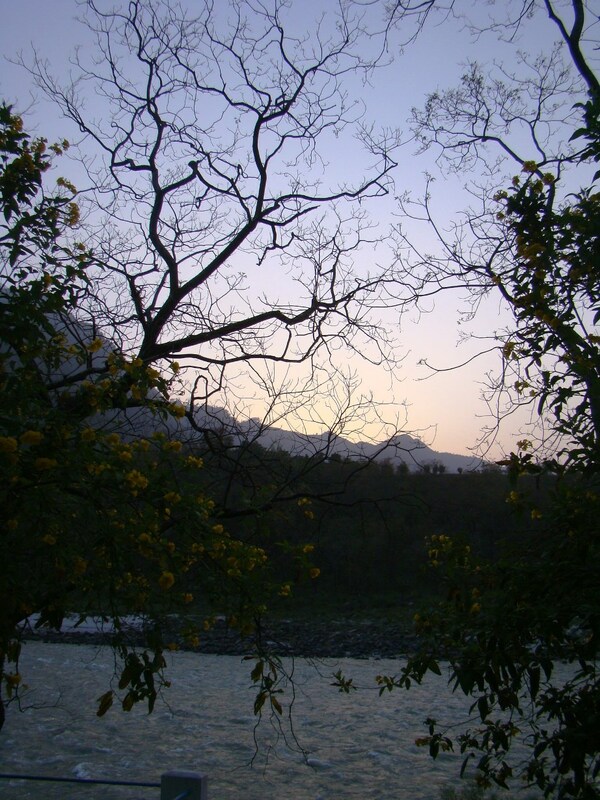 I am getting all nostalgic, we enjoyed our brief stay in Rishikesh just gazing at the Ganga, our hotel too was right on the banks of the river. We too are not the checklist holiday makers, we prefer to experience the place. By the way what is a namak para? Is it some kind of nankhatai? We are actually very eclectic travellers, that way. Sometimes we like our holidays to be packed (for instance, when we went to Hyderabad last year) – though, even then, we always try to make time to just sit back and relax now and then, not drive ourselves completely crazy trying to see every sight. This time, however, the holiday was solely in order to relax. We had all been so tired and wound up for the past few months, we just wanted to go somewhere tranquil and lovely. Just to unwind. Namakparas are made from a flaky salted dough – I think maida kneaded with salt and oil is the basic dough. It’s cut into strips and deep fried to be a snack which can be stored for at least a few days. Somewhat like matthri or matthi, if you’ve had that. The namakparas at Neemrana had a little ajwain in them and were very light though still crisp. Loved them! I’ve never had nimki, though I’ve heard of it. Sounds delicious! Namakpara is what Bengalis call Nimki. I guess it is made in the lines of The Ananda in the Himalayas which caters to the super rich on exotic pampering holidays, which is made exclusive by the package/rate card. No, this isn’t in the same league as Ananda. I’ve not been to Ananda myself, but since I’ve worked in the hospitality industry for a few years, I am quite familiar with the amenities they offer. The Glasshouse on the Ganges doesn’t quite fall into the same bracket. It’s rather more geared (like nearly all of the Neemrana Group’s other properties are) towards upper middle class people, mostly from the metros, who’re looking for a weekend break. It isn’t ‘exotic’, and the pampering is also very low key. As for the tariffs – well, we had to settle for the one we got, just because there wasn’t a more affordable option available then, and this was the only weekend both our families were free. Plus we were so desperate to get out (we haven’t travelled anywhere for the past year, and stress levels have been building…) – well, we decided it was worth it. They do have a wide range of rooms and tents (even cottages) available. You have no idea how close you are to the truth! ;-) No, the stay was no adventure, but our journey there and back was – with two below-2-year olds, one of them prone to mountain sickness (which her parents hadn’t realized she had developed), with a horribly hot and uncomfortable previous night at Dehradun, where we got almost no sleep… and more. By the time we got to the Glasshouse, we were all so pooped, we needed all the pampering we could get. Ananda would have been just fine! Sounds lovely. I need that place. Now if wishes only were horses…. Yes. I was thinking of you, Anu, and a couple of other friends who I thought could do with a holiday like this. Tranquil.